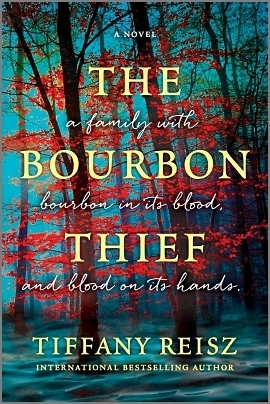 From Goodreads.com: When Cooper McQueen wakes up from a night with a beautiful stranger, it's to discover he's been robbed. The only item stolen—a million-dollar bottle of bourbon. The thief, a mysterious woman named Paris, claims the bottle is rightfully hers. After all, the label itself says it's property of the Maddox family who owned and operated Red Thread Bourbon distillery since the last days of the Civil War until the company went out of business for reasons no one knows… No one except Paris. I will be the first to admit that not only did I enjoy this author's Original Sinners series, I was also a bit... hesitate to read this one. Would she be able to pull off a story that was as engaging and complex as her Original Sinners? I should have known that the answer to that question was unequivocally YES! I LOVED this story. Yes, there were times that it was increasingly dark (unfortunately I can't go into much detail without giving away important story-lines), but for the most part it was a gripping novel that dared to go where few other novels would ever dream of going, tackling topics that may be uncomfortable. One of the things I will forever be in awe of is the way Ms.Reisz can take a story-line most others would shy away from and not only bring it to life, but do so in such a way that the reader is drawn in - unable to put it down even if it makes them uncomfortable. She carries the mark of a true writer, and that is evident in her story-telling. These characters were not without their faults or their secrets, but it was those faults (and especially those secrets) that made them so appealing. These were strong characters who despite their circumstances were determined to make the best of a bad situation. This book may span generations - but it is done so in such a way that leaves the reader on the edge of their seats, unable to put the book down for want of knowing what comes next. Overall - I would recommend this story to anyone who enjoys gripping read that will leave you emotionally wrecked (in a good way).